In THE MONSTER WHO LOST HIS MEAN, a little boy wants to be mean because that is what he is known for. The problem is his “M” is lost. He was convinced that ‘Without my M, I’m not myself – I’m someone else instead.’ As he challenges others along the way, he gives in to being nice and friendly. At first this really bothered him. ‘I really need to stop this stuff and do what MONSTERS do,’ he said. He even considered pretending he was mean just to get back to being himself. But, in the end, his friendly behavior resulted in some amazing friends and won out over being mean. 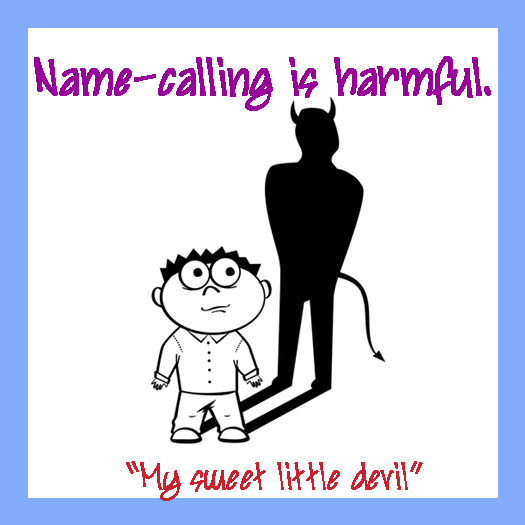 Criticizing children by name-calling is like putting big sticky labels on their foreheads. When we tell them they are mean, sneaky, fat, or stupid, they believe us. When lots of people around them (teachers, relatives, neighbors) call them these names also – sometimes because they have heard us do it – the children believe it even more deeply. And, when people around them expect them to act out what these names say, they begin to do just that. They bully people, lie, eat unhealthy foods, and stop trying in school. Name-calling is harmful. I know that sometimes labels are meant to be endearing, but we must remember that children take things at face value. They aren’t good at figuring out “what is meant.” I remember taking my daughter to meet a family friend whose name was Mrs. Green. I kept preparing her in advance that we would be going to see Mrs. Green. She told me when she was older that she fully expected to meet a lady with green skin. I know we call kids names many times with a loving/playful tone of voice and don’t intend it to be critical (“My sweet little devil.”) but the child’s brain may be just reacting to what they know the words to mean, not what is intended. I’ve proven the power of name-calling many times in my classes. Here’s what I do. I have the adults in my classes put a strip of paper around their foreheads. I go around the class and attach a small card with one word on it on the front of the headband. Everyone in the class can see everyone else’s word, but can’t see their own word. On the other hand, the “funny” one is asked to entertain, and the “organized” one is asked to keep the records. (So they will both get even better at what they are already good at.) After a few minutes of this task, I ask each person to guess what his or her word is. Amazingly, most can get it right. With just this little, pretend experience, adults figure out the label and know how they are viewed by others and are expected to act. If adults are this easily influenced with such a short, not even real, experience imagine how easy it is for a child to believe and act exactly like we tell them to with our labels. I am reminded of an example my daughter shared with me. Her highly experienced pediatrician always said that “Kids are what they wear.” When kids came into his office wearing t-shirts with sayings on them like “I’m a little terror,” “Princess,” etc., they acted just like their shirt said 98% of the time – another example of why we need to choose our words carefully with children. Be sure to follow our daily Decide and Practice blog post that will help you decide to avoid criticizing children and practice better ways to correct and teach them. I’m going to switch gears slightly away from how we don’t want to talk to children – choosing our words carefully so we avoid name-calling and criticism – to how we do want to talk to children. I don’t want all the discussion about name-calling to make you think I am saying we shouldn’t correct children or expect them to do better. There is a big difference between being critical and being a responsible parent who teaches a child what is expected of him in life. It is possible to teach children how to do the right things and how to do things well without using criticism. Jean Illsley Clarke, an award-winning parenting education author suggests the following way to avoid criticism and to teach the lessons children need. “do this …. Instead “ (Show how to do the right thing.). With this approach you are teaching a child how to do better. This is the opposite of criticism. Be sure to check our blog daily for parenting tips and on July 15 we will continue thoughts from THE MONSTER WHO LOST HIS MEAN. Part Two will be about compliments instead of criticism. Decide: You can be who you want to be. Practice: Today, think of five things you often heard said about yourself at any age, child or adult. Write them down. How many that you wrote are negative? Shut the negative ones in a drawer or put a lid on them in a box. Post the positive ones where you can see them often. This entry was posted in Communication, Discipline and tagged consequences, criticism, discipline, name calling, rules, who I am. Bookmark the permalink.